Yesterday was a beautiful spring day in Ulaanbaatar – bright and sunny, and clear blue skies for most of the day. 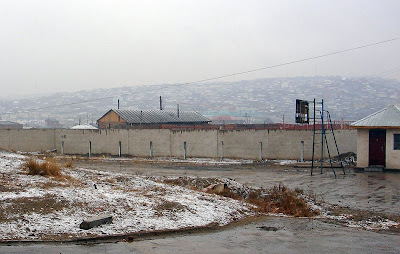 But when I woke up this morning I saw that Ulaanbaatar is living up to its reputation of unpredictable weather - it was snowing. Ulaanbaatar is the coldest capital city in the world – in fact it is the only one with an average annual temperature below freezing point. It has long cold winters when the temperature during the day rarely gets above 15 below zero, and at night drops to 30 below zero – and sometimes even down to 40 below. It has short warm summers – although it rarely gets much above 20 degrees. At this time of the year I was told it is pot luck as to whether the day will be cold or warm – but I was surprised at how much the temperature had plummeted overnight. As I drove between meetings I was amused to see quite a few young women walking in the snow in leather boots, mini-skirts and summer blouses with bare arms – it seems they had already changed into their summer gear and weren’t ready to go back into the closet and dig out their winter clothes again. Or maybe they are so used to the cold, a day hovering around zero is a warm one for them.